Duke Special and Tim Minchin duetting live in Belfast. Strangely disturbing. I could drive, I suppose, using the not-so-mighty (chassis condemned by local garage)Isuzu, which is still working fine, if now a little wandery when it comes to steering. It's a bit like guiding a boat into harbour on a very stormy day. However, the £2.70 bus ride is a no-brainer in weather like this. 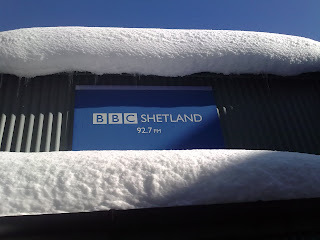 Over a foot of snow fell on Shetland yesterday, and stayed put. More fell today and much more is expected tonight and tomorrow. It's a perfectly ordinary wee bus, but (so far) it has never failed to get through in sometimes apocalyptic conditions. 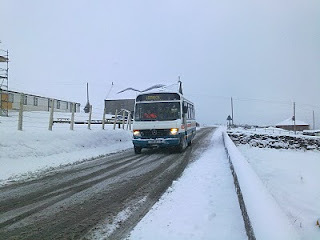 Operated by Johnson Transport, the 35-mile run between Lerwick and Hillswick goes through probably the most exposed sections of Shetland's landscape and connects with feeder mini-bus services from outlying areas such as North Roe, Ollaberry and Eshaness, and as well as passengers carries parcels of all description. On Monday night, in blizzard conditions, Gary Johnson, who owns the company, personally covered one of the feeder routes in a 4X4, while two council snowploughs led the other buses safely to their destinations. Tonight, things were more straightforward (clear and calm), but it still took a snowplough running ahead of us to guide us safely to Hillswick. 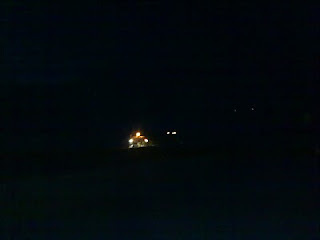 That's it retreating into the darkness after I was safely delivered to the house. As I write, it's freezing hard. There's no 10.00 am "shopper" bus tomorrow, so I have to decide whether to get the 7.30am commuter service or take the pick-up in. I was intending to park it on Lerwick's unofficial second-hand car lot at North Lochside with a 'for sale' notice on the windscreen. 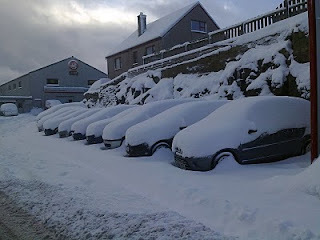 But as I say, with snow like this, it's a no-brainer. The bus it is. If I'd had access to this at university it would have transformed my (lack of) appreciation of Finnegans Wake. "Me back! Me back! Me back!" A still and very cold but beautiful night for Da Nort Up Helly Aa, the galley burnt on the water (once the ice had been broken) and a great time had by all. The picture shows The Two Sandy Nelsons and The Two (heavily swaddled) David Nelsons (one technically a Seoras), Elaine and Caroline Nelson. Much entertaining satire at the hall later, best left undescribed, fabulous mince and tatties, and some very nice Clynelish 14-year-old, which is perfectly suited for outdoors flask-related consumption. 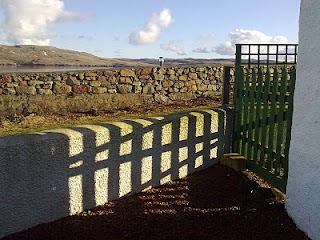 The galley Baresark is in position at the Hillswick seafront, there are vikings in the vicinity, the weather is cold and clear, with the occasional flurry of snow. All is set for a day and night of revelry, polite waving of axes and general good behaviour...all the best to Brydon Anderson and his merry men (and women - this is an equal opportunities Up Helly Aa). 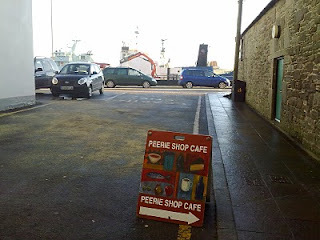 The usual Saturday morning trip to Lerwick for Music Club, which leaves me with space for my usual fruit scone and cappuccino at The Peerie Shop Cafe. I'm never there at the right time for the legendary strawberry cheesecake or even one of the cataclysmic sandwiches, which is weighing heavily on me. I must adjust my schedule. 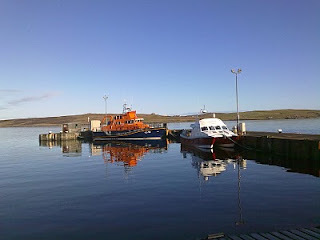 Here in Shetland (Or Simonkingland as we must now call it, now that it has been discovered by The Weeping Attenborough) we are adjusting to the televisual fame which will doubtless see a slew of tourists arriving to view otters, killer whales and various Kings; they are of course ten a penny around here. Actually, joking aside, a friend phoned the other day to say that he thinks otter behaviour is changing. And it's not just that they've all got agents nowadays. Sorry. He was saying that they're far less shy and prone to eating any old thing that comes their way. Notably, in once recent case that he witnessed, a rabbit. Which it had seemingly drowned. The phrase 'you look like a drowned rabbit' springs to mind. A busy week ahead. It's Up Helly Aa week here in Northmavine, and it promises to be one of the busiest, and, worrying, snowiest in recent memory. My son, daughter-in-law and grandson are arriving, Martha has five pals staying over, Sandy and Caroline and baby Seoras are coming from Unst, and there have been sightings of the lesser spotted Simonus Kingus, despite him abandoning his cottage hereabouts as it was too, like, rural. That's the thing about wilderness. It can be rather too wild. Thanks to Lindsay Hutton for sending this through. Proof positive that it really happened! I've seen Steve Earle play live several times, and met him just the once, in the embrocation-heavy atmosphere of the Clickimin Leisure Centre's concrete corridors. 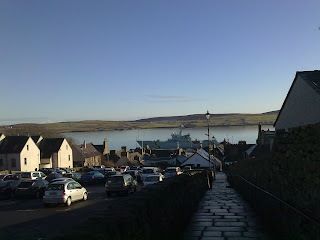 That was in Lerwick, in 2003, and I was as nervous as a kitten. I interviewed him for the radio show, and for The Shetland Times, stumbling over words, gulping with nerves. He was Atkins-Diet-emaciated, beardless, balding, tiny. But forthright, funny, and, as I later discovered, repeating the same anecdotes he gave to every interviewer on that tour. 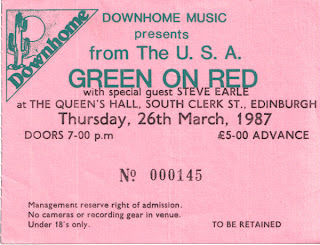 I had followed Steve's career since seeing him play a stunning support set to, of all people, the gothic indie Americana band Green on Red at Edinburgh's Queen Hall in either late 1986 or early 1987. I remember being amazed to see Steve - of whom I'd never heard - and the Dukes, diving offstage straight to the public bar. They were blindingly good, ripping the place apart with a performance mostly comprising the Guitar Town album. Chuck Prophet of G on R commented grimly as his band tried to follow on, 'thanks to Steve Earle and the E Street Band'. Well, quite. I bought Guitar Town, headed for Shetland shortly afterwards trailing debts,threats and unhappiness. But I had with me Guitar Town, which was at that stage known only to very few Shetlanders. By the following year, with Exit O, the next Earle album, well and truly out and ubiquitous in the isles, I was in a pub band and performing 'I Ain't Ever Satisifed' in places like the Ferry Inn and The Excelsior. Steve's life took its roller coaster course, involving full-on rock, drug addiction, violence, prison, huge weight gain/loss, political activism and eventual...is redemption the right word? By 2003, Steve was a Shetland superstar. That solo gig sold out in three hours and, when he was booked to return last year,with son Justin Townes and (most recent)wife Alison Moorer, excitement knew no bounds. Alas, weather problems saw it cancelled. He's an important musical figure in my life, Mr Earle. I saw him perform a rampagingly aggressive rock set at Barrowland in 2004, and a tediously humble bluegrass set with Del McCoury at the Armadillo in Glasgow. I thought he was great as Walon in The Wire, and he's produced some of the most potent music of recent times, confronting the political establishment in the USA and the musical establishment in Nashville along the way. These clips are both from the David Letterman Show, 21 years apart. Cocaine plays a big part in the first one. Both are wonderful in their own ways. I thoroughly enjoyed the first episode of Simon King's Shetland Diaries, despite the fakery and the wide-eyed southern wonderment at things we tend to take for granted here in The Great Bog. First, let me say that it is fantastic to see what a professional filming team (and it was a team; there was a full crew there much of the time, apart from Simon and his wife) can do with Shetland's wildlife. I was stunned by the Orca and Bonxie/Tirrick chick attack footage, the otters were great and it was instructive to see the painstaking and dangerous preparations for filming the gannet nests. I'll be interested to watch the next episodes to see if they reflect how much time the King family seemed to spend in Frankie's Chip Shop - good move, by the way; those are GREAT fish suppers - and also to see if the more urban (and urbane) aspects of Shetland life are reflected. The Kings' landlord is a pal of ours. He is also a lawyer and expert classical guitarist, not just a shearer of sheep. Tom Waits's Ol' 55 is not to be taken lightly by anyone. Here's the woman behind the current TM Show's album of the week, Maeve O'Boyle (from Stepps, of all places) taking on Waits from the days when he wrote songs, not theatrical interludes.